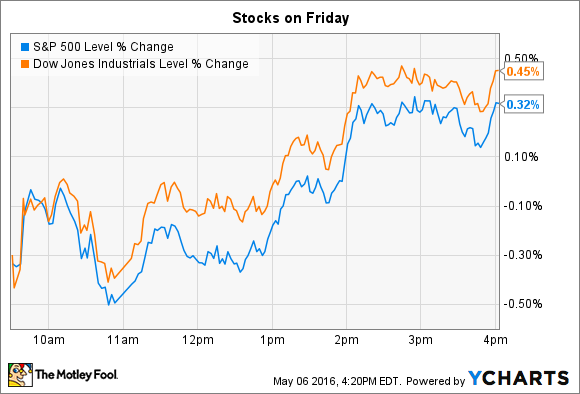 Indexes rose despite lackluster news on economic growth. According to the latest official employment reading, the economy generated 160,000 new jobs in April, marking a big slowdown from the recent average of 230,000 jobs per month. Balancing that weaker job growth was the fact that wages logged strong gains, with hourly pay up 2.5%, year over year. The slowdown might make it less likely that the Federal Reserve will raise interest rates when it next meets to discuss monetary policy in June. Meanwhile, individual stocks making big moves on Friday included Activision Blizzard (NASDAQ:ATVI) and FireEye (NASDAQ:FEYE). Activision was the S&P 500's biggest percentage-point gainer, rising 7% following first-quarter earnings results that blew past management's guidance. The owner of hit global-video game franchises like World of Warcraft, Diablo, and Call of Duty saw revenue jump 14%, to a record $1.5 billion, as adjusted earnings also set a record at $0.23 per share. It was Activision's first quarter to include contributions from the newly purchased King Digital business. King's base of 463 million mobile users combined with record player communities for both Activision (55 million) and Blizzard (26 million), to push the company's engaged gamer base to 544 million. Across the portfolio, players collectively spent 42 billion hours interacting with Activision Blizzard titles over the last year, which puts the company on par with many large global entertainment networks. The company isn't having trouble monetizing all of that engagement, either: Digital revenue spiked higher by 59% this quarter, and set a new record at more than 60% of sales. Looking forward, Activision raised its 2016 sales and profit outlook as management seems confident that it can successfully navigate a stacked launch calendar that includes Overwatch in late May, a World of Warcraft expansion in August, and another Call of Duty installment in early November. Cybersecurity specialist FireEye plunged 19% after announcing first-quarter earnings results, along with a management shakeup. The top-line numbers were solid: Revenue rose 34% on healthy billings growth. However, the company's net loss widened to $0.98 per share from $0.88 per share a year ago. Gross profitability held steady, meanwhile, at 70%. Wall Street wasn't impressed with a downgraded sales outlook that now calls for revenue of $795 million compared to the $830 million FireEye had projected in February. The gross margin and net loss forecasts didn't change, but management is apparently seeing a slowdown in billings relative to what they targeted just a few months ago. In a concurrent press release, FireEye also announced that its CEO Dave DeWalt would be stepping down to be replaced by current board president, Kevin Mandia. Mandia has several important challenges to attack as soon as he steps into the leadership position next month, including improving the company's sales growth rate. But he'll have to balance that goal with the targets of achieving consistently positive cash flow, and putting an end to mounting losses. DeWalt sought to assure investors that executives are taking these financial goals seriously: "We remain committed to accelerating our progress on the path to profitability," he said.